This Scares Me – HUNKER DOWN! I don’t like the level of risk tolerance investors have at the moment – it looks to me like the rich have determined that the governments and central banks of the world will not allow stocks to fall dramatically, so they’re using leverage without proper consideration of the risks involved. Charlie Munger, a man who doesn’t weigh his words and is known for his blatant remarks, said in Berkshire Hathaway’s recent annual shareholder meeting that the financial crisis has led to the introduction of policies that grossly and purposely benefit the rich. I couldn’t agree more with Munger, and that scares me. The proof is in the pudding, as the graph shows clearly. Though the market has changed in 2018, with higher interest rates, a trade war, and a tighter financial environment, investors are leveraging to the maximum. The idea of a crash eludes them. The U.S. has turned its head to the majority of the population. The past 10 years have taught us one thing, and I want you to truly grasp this because this attitude is the same in Canada, Europe, and Australia: the fiat monetary system, under its current form, only serves the rich. 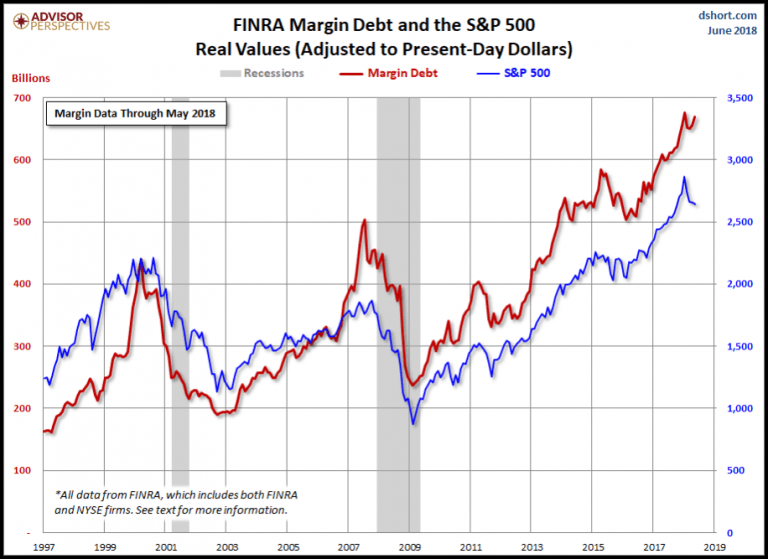 A system based on debt and margin will always generate excess returns to those who have access to credit. The poor and middle class are not operating on a level playing field. The purpose of today’s letter is to provide you with a roadmap to wealth in today’s Western world. It is the honest truth, as I see it, after meeting with over 50 multimillionaires in the past 5 years and becoming one myself. RAGS TO RICHES 2018: BITE THE BULLET! Money does not make you rich: Out of the 50 multimillionaires I sat down and built a relationship with, only 3 have made the bulk of their wealth using inherited conditions, be it a cash infusion or a business that was left to them. Most wealthy individuals who enjoy a great life in today’s world have done it through sheer skill. 3 out of 50 is 6%, which means that 94% are self-made millionaires. This is incredibly important because people believe that the rich have “cornered” and monopolized opportunity, but the truth is completely the opposite. Money is made unconventionally: Most multimillionaires have revealed to me that they followed their heart — not advice or conventional wisdom — in their struggle for wealth. The overwhelming majority indicated that they recognized a problem they believed could be solved by a small operation, not a large-scale one, so they started a business based on ONE client. This is a startling fact because it means that the starting point for these millionaires is in serving one person and then growing from there. It is also important since it unearths a great business truism, which is that a small-time enterprise has advantages over large and slow-to-react companies if you can detect their blind spots. Employees can become super wealthy: I’ve talked about this for years, and it became more evident to me in the past 3 years: companies are so profitable and competitive that valuable employees can achieve radical wages by the time they are 40, at which point they can decide if they want to strike it on their own. Remember this because most of the people, 95%, are employees. Wealth isn’t barred from you if you become indispensable. It might require firing your boss and finding a better employer, but the salaries offered to people with the right leadership and managerial skills are ridiculously high. Sacrifice is everything: None of the multimillionaires I spoke with had any remorse for having spent thousands of hours failing to meet their goals and starting over many times, before finally making a breakthrough. The type of riches that allow you to afford a balanced life come with a fair share of lessons, which the wealthy appreciate learning. Free lunches are out there, contrary to what the phrase says, but the likelihood of being part of a situation in which money falls into your lap is scarce. The millionaires I spoke with have all mentioned that wealth requires a great deal of personal development and constant tweaking of character. There is no other way to reach success but to NEVER QUIT. Championing people: In the following two lines, I uncover the Promised Land, the kingdom, the one secret of self-made millionaires. I want you to think about this, meditate on it, and realize that you can do this because no college can teach you this, nor book, course, or mentor – it is based on one thing: PRACTICE. People who make it in life are addicted to building trust. They see trust as the underlying cause for their success. It helps them retain clients for decades instead of years. It allows them to get the best out of their employees. It makes their lives easier at home, and most of all, it makes life enjoyable.